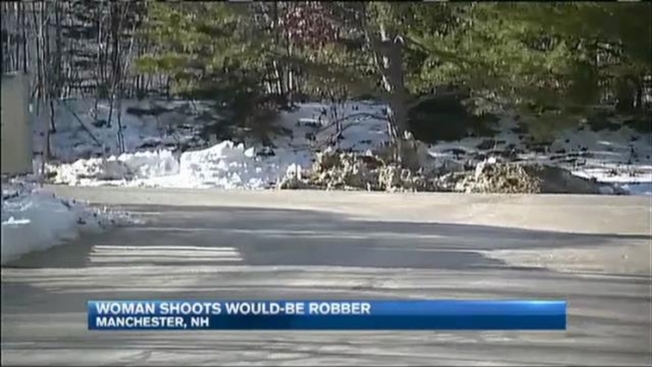 A 65-year-old grandmother armed with a handgun turned the tables on a young man trying to rob her outside her home in Manchester, New Hampshire. The woman, who has asked not to be identified, tells necn she's had a concealed carry permit for more than 10 years, but Monday night was the first time she's ever fired her gun. "There's no way in hell I could have overpowered him," she said in an interview inside her apartment building. That's the reason police say the woman became one man's target late Monday night. "They probably looked at me and thought, 'oh, look at this older lady, she's little,' and thought I was an easy mark," the woman said. As it turns out, they messed with the wrong grandmother. "I didn't have time to think, I just pulled the gun and shot him because he was trying to come at me," she said. "As soon as I shot him, he immediately fell to the ground right away." Police say 23-year-old Michael Bontaites, standing a foot taller and weighing in about 100 pounds more, saw the small-framed woman at a nearby gas station and then followed her into the parking lot of her apartment complex. "I said to myself, 'this is not good,'" the woman said. "I just knew, I just knew." Before walking to the front door of her apartment building, her instinct kicked in. "I decided to take the gun out of my purse and put it in my pocket," she said. Police say Bontaites ran up behind her and reached for her purse, and that's when she fired her gun. "I work hard for my money. Sorry, you don't have a right to take it just because you need to buy drugs or whatever it is," she said. "Sorry, it doesn't work that way." She shot Bontaites in the chest. While she's glad she didn't kill him, she's not offering any apologies for pulling the trigger. "If I didn't have that weapon, God knows where I would be today, I could be dead," she said. "I had every right to use my weapon." Bontaites was charged with robbery while still in the hospital. He is due in court on Jan. 14. Police say the investigation is ongoing and more charges are possible.